While Australia has only published RBA Meeting Minutes, the US is publishing Manufacturing Production,	Industrial Production, Capacity Utilization and USD Industrial Production. 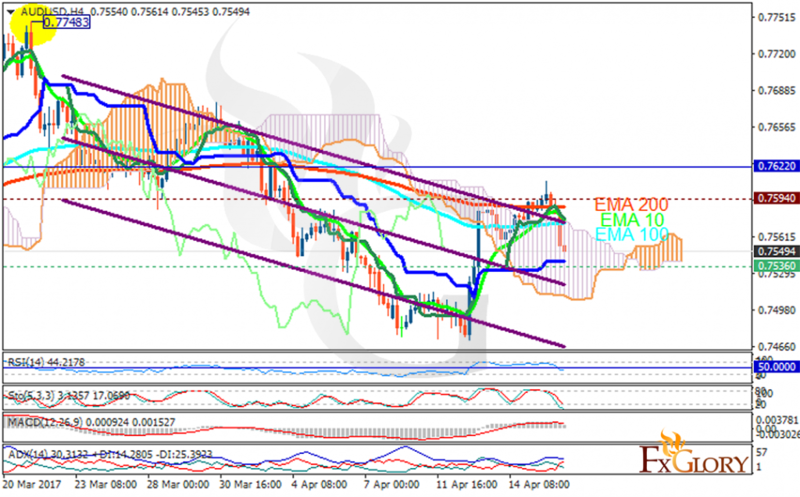 The support rests in 0.75360 with resistance at 0.75940 which both lines are below the weekly pivot point at 0.76220. The EMA of 10 is moving with bullish bias and it is located between the EMA of 100 and the EMA of 200. The RSI is moving below the 50 level, the MACD indicator is in neutral territory and the Stochastic is showing downward momentum. The ADX is showing sell signals. The price is in the Ichimoku Cloud and below the Chinkou Span. The Tenkan-sen is showing a downward trend while the Kijun-sen is showing a horizontal trend. AUDUSD will continue its bearish trend targeting 0.74.